Luxury finishes and dramatic custom cabinets and lighting combine to build a space that lives much larger than its footprint in this third-floor end unit with wrap-around balcony. Porcelain wood tile floors lay a stylish and durable foundation. A galley kitchen at the entrance leads to the sleeping area, which also has ample storage and a small sitting vignette. The 250+ square feet of balcony space are the perfect setting for enjoying coffee or cocktails with a Gulf view. All furnishings and decor convey with the sale of the property, which has never been rented and is in excellent condition.The two-burner cooktop and convection microwave oven allow you to cook a full meal. Slide-out refrigerator and freezer drawers are accompanied by an N'finity Pro dual-zone wine cooler, topped wiCalcutta gold marble countertops. An LG combination washer-dryer hidden behind one of the cabinet doors ups the convenience factor even further. Another surprise awaits you in the sleeping area: fold up the Murphy bed to transform the entire interior to living space, creating a comfortable setting for dining and entertaining. The closet has been expanded and outfitted with custom shelving. Cabinet accent lighting and Schonbeck chandeliers mean plenty of stylish lighting, and custom crown molding complements the ten-foot ceilings. The upgrades continue in the bathroom, where you'll find Calcutta gold countertops, more custom cabinet work, and a large tile shower with glass doors. Nightly, weekly, and yearly rentals are popular in the building. 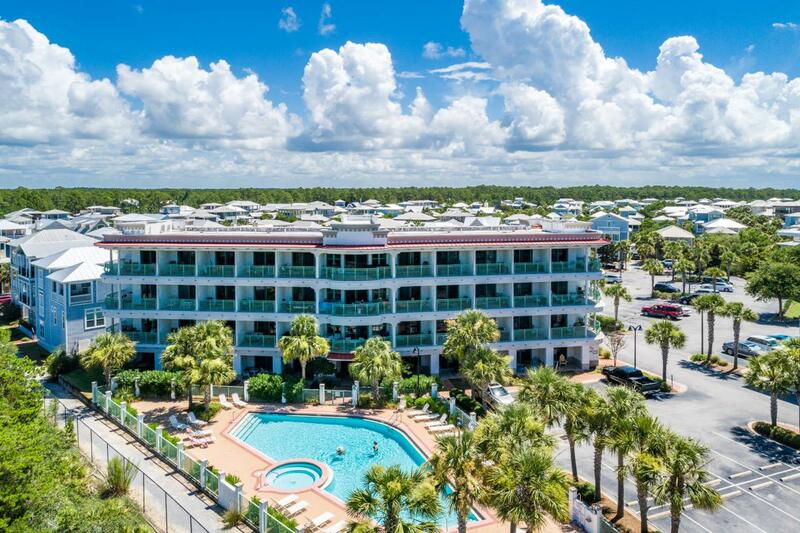 This great vacation getaway has Gulf views, beach access and is within walking distance to restaurants, shopping, entertainment and activities of Alys Beach, Rosemary Beach and Seacrest Beach. Condo is centrally located to the best dining, unique boutique shops, bike paths and golf courses along the Emerald Coast. Easy access to Hwy. 98, allowing you easy access to Panama City and the new Northwest Florida Beaches International Airport.